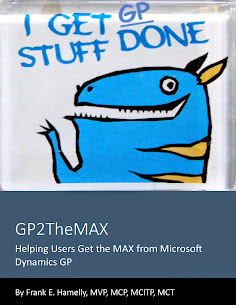 GP2TheMAX - Helping users get the 'MAX' from Dynamics GP: Why do you think your company's utilization of GP is not optimal? Why do you think your company's utilization of GP is not optimal? It's interesting to note that fully two thirds of the responses (67%) indicate lack of training after implementation. This supports my personal observation over a decade of software implementations that most companies don't understand or appreciate the value of recurrent education for their employees. I truly believe that the difference between a good company and a great one is the investment made in employees. So how do we address this issue? That's going to be the topic of a future blog post so stay tuned . . .